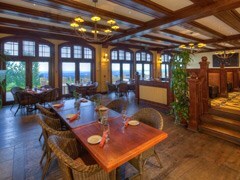 The Calcutta Grill, nestled 900 feet above the Sound, offers a selection of the Pacific Northwest's favorite foods, friendly and attentive service, and the Eastside's best Happy Hour. Enjoy dining on our two breathtaking patios with a menu offering a wide variety of delectable entrees, from a generous cut of Prime Rib to mouth watering pan seared Sea Scallops. Or, if you prefer, cozy up next to the fireplace with your favorite cocktail in our English style Pub. The Calcutta Grill is the perfect rendezvous for every occasion….or no occasion at all, with a view that is second to none.